Help Mikey make the right choices to make it out of his home safely, in this interactive animation. Share more adventures with Mikey in the storybook Mikey Makes a Mess. Thanks to Brueggers, Canandaigua National Bank and other area businesses, who carried donation boxes for Prevention 1st during the promotion of the Home Fire Drill campaign at these locations. Thank you to all these participating organizations who displayed "Change Your Clock, Test Your Alarms, Practice Your Home Fire Drill" signs. People still just don’t get it. Several surveys over recent years continue to find that 80%-90% of Americans feel safer from fires at home than in a public building, or feel equally safe in both locations. Unfortunately, they couldn’t be more wrong. Read	more. 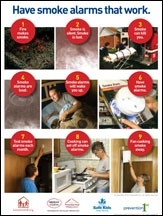 This 7-minute video created by Prevention 1st, Monroe County, and the City of Rochester, New York, shows why and how to plan and practice your home fire drill. 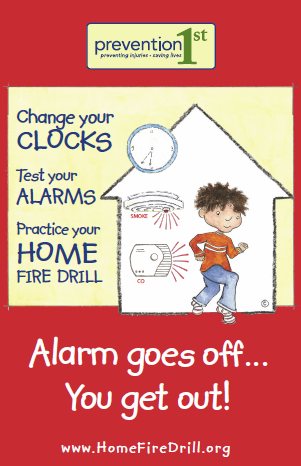 Change Your Clock, Test Your Alarms, Practice Your Home Fire Drill, Alarm Goes Off You Get Out! Click here to join Wegmans Food Markets, Burger King, Friendly's, Canandaigua National Bank and others in promoting this life-saving message. Learn how to do an effective workplace fire drill.